Frugal Mom and Wife: Free Gluten-Free Betty Crocker Product Coupon! (Mailed) First 25,000! 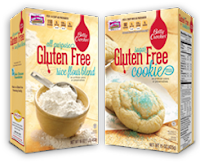 Free Gluten-Free Betty Crocker Product Coupon! (Mailed) First 25,000! Simply follow the link below to request your free mailed coupon.